The Snowy Mountains Trout Festival is just around the corner and people are already calling up to get the hot spots and orders in on lures,Fly's etc.Okay we are now ready for the onslaught of the trout festival and we are stocked up to the roof with Scrub worms, Mudeyes, Power Bait, grubs. The Cobbitty Aids Leukaemia Fund or CALF is holding its charity fund raising at Buckenderra Holiday Park from the 21st-23rd October. Call the park if you are interested in attending. We have our new range of Sage Ones in stock, so if you are in the area come with your own reel and have a cast with one of our staff members out on the pad. This is the only report we have had this last fortnight form Jindabyne. I used a combo of wet fly and the snowy minnow from 4 pm after the days skiing up in the mountains!!! The Thredbo is still fishing well and you do have to walk to get to them but it is worth the walk as this lucky angler Stewert Gordon found out. On lake Eucumbene it had been really good fishing once you pick the right weather for it. With the lake rising so fast it you have plenty of areas to hide in. Most reports are coming through from Providence Portal, Anglers Reach, Old Adaminaby, Seven gates, Frying Pan, Buckenderra. I called in to the shop on friday to pick up a couple of black nymphs. Glad I did as I landed four fish that night. 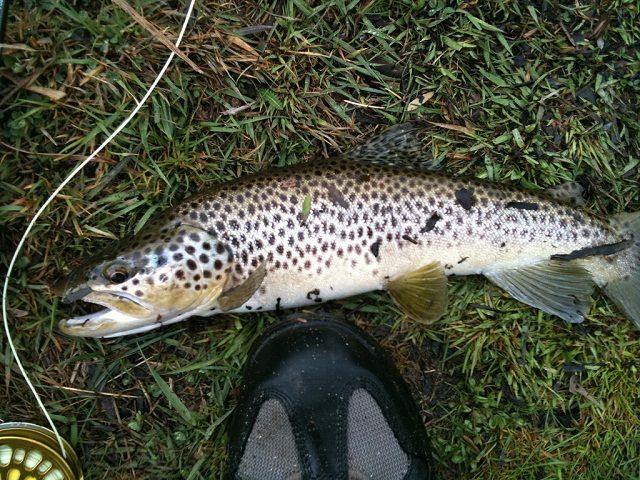 First fish was a rainbow around the 2lb mark, second fish one the same and then the action started at dark with a 3lb brown followed by a magnificient 6 lb male brown. We had a great time at fryingpan thanks to Dawn and Barry and came away with seven fish. The nymph was fished mid water and slow to medium retrieve. Nice fish Paul very nice. Father and son combonation of Rod & Mitchell Dickins had a great trip on the lake. Visited your great part of the world last Thursday / Friday Sat & part Sun with my 12 yr old son Mitchell . Whilst we stopped by the shop on the way down we didnt get a chance on the way home to give you a snapshot of how we went. We stayed at Anglers Reach Lakeside Village . The fishing overall was great with the majority of our effort focussed on both the top section of the lake and the river just above where it joined the lake . We caught over 40 fish over the two and a bit days , and not surprisingly all but two were rainbows . Whilst we saw the odd fish rise , all fish were caught with bead head nymphs either on the drift in the river , or stripping in the lake . Most fish were around the half kilo mark with the biggest probably going 1 ½ Kilo . They were all in great condition and pulled particularly hard for their size . Many regurgitated frogs ( which we saw plenty of on the road at night ) . No doubt there is a lot of food being washed down the Eucumbene river and small tributaries at the moment so the fishing should only get better over the next month or so as it warms up. Flies that are performing well are Mrs Simpson Brown, Mrs Simpson Olive, Woolly Bugger in Black and Olive. Bead head Nymphs in Black and Olive. Tantangara Reservoir We still have not heard from any anglers whom come over the mountain and fish the reservoir. The reservoir is rising quite well and should increase with the current snow falls and rains. We have only had one report from the area and that was last week, So I hope to have more over the next few weeks as there was a competition over the weekend up at the reservoir. Eucumbene trolling reports have been good many anglers getting ready for the season opening and the few keen ones have been coming up early with some nice results. So far the Old Adaminaby, Dam wall, Buckenderra , seven gates are still fishing well. 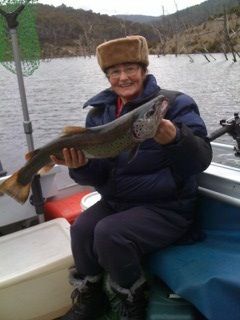 Helga Alexander and her husband are had a great day troling, Here we have Helga with a lovely rainbow Trout, sorry guys but the photo of your hubby did not work, so he will have to catch another fish to get on the web report. Also Snowy mountains minnows are back in action and doing well. 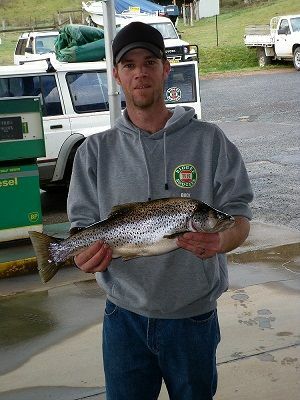 Best areas to fish around the dam wall, Poo bay down below the Jindabyne club, snowline caravan Park. things have been a little slow so your lure selection is important. Blade lures and stiffy lures would do well on the big browns as will the rainbow Squidgies lures, Rapala X-Raps and Jointed minnows are working as well. Pegron in Pm2 , Pm7, Pm8 are coming back in to the wing of things. The bait fishing has been great and we are swamped with pictures, thank you to all whom stopped in and showed us the fish and supplied us with details. Geoff Bleathman is one lucky angler who caught a Brown Trout weighing in at 2.5Kg and 61 cm long on Rainbow Candy under a scrub worm. He was so happy with his fish he was straight off to Skins Alive to have it mounted. Good one Geoff hope you get plenty more to mount. 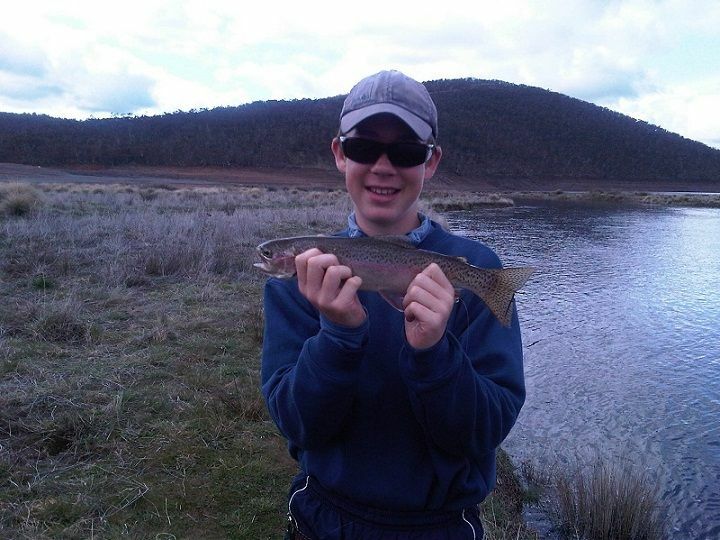 Jindabyne is still fishing really well regardless of the releasing of the waters. The fish have been caught on Power bait under scrub worm and some reports show mudeyes are coming in to the swing of things. If the weather allow if you cannot go past a worm under a bubble float and hold on as the big browns take off with it. 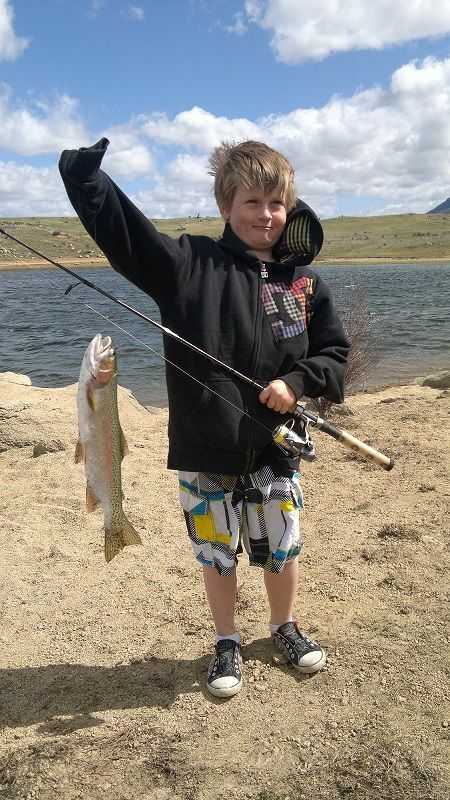 Young Lochlan Giulaini went out with his family and out fished his father as usual so I hear. Great fish Lachlan may it be the begining of many more to come for you. It will be on from the 21st-23rd Oct, so if you are free call the park and direct your inquiries to the park. Busy weekend at Buckenderra alot of boats around and the trolling is picking up we are still being told they are being caught in the shallows and a lot around the trees the Viking fishing club caught 17 rainbow and 48 brown the largest cleaned weighed 2.55kg caught on various Tassie devils but black and red the most popular, very similar reports all weekend with the Tassie devils and a lot of browns caught. 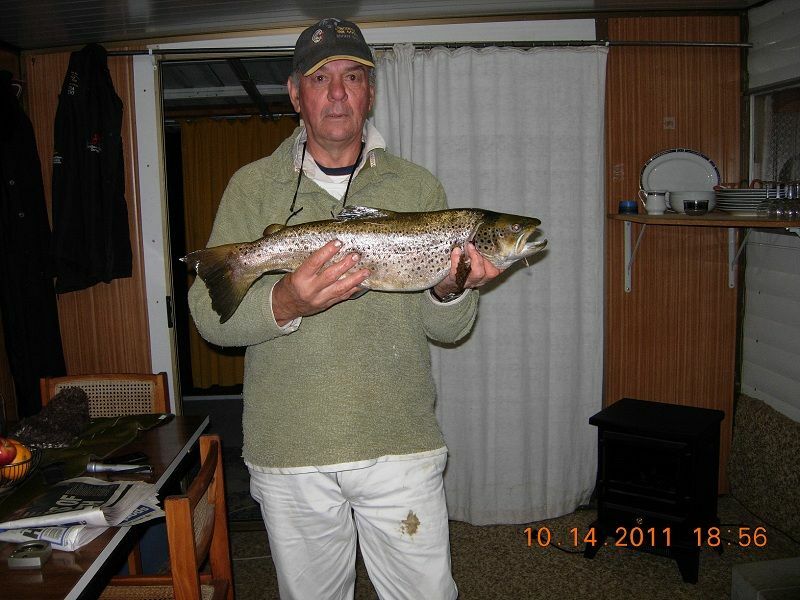 Martin caught a nice brown on a yellow and black Tassie early in the morning weighing 2.1kg.Rainbow trout rapallas were also used and nice 1 to 1 1/2kg browns caught on those. On the bank the scrub worms done well and the powerbait chunky cheese, pink and orange were all popular with a lot of rainbows on the end of the lines. Fly fisherman found it hard work over the weekend although the nymphs seem to do quite well.. Cheers the Team at the Alpine Angler. 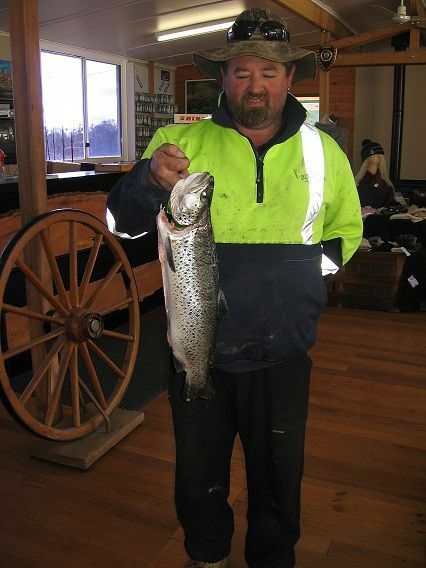 This years 38th annual Yamaha / Freshwater Fishing Snowy Mountains Trout Festival will be run from Saturday the 29th of October to Friday the 4th of November 2011. The last weigh in time will be 10am on Friday morning. Remember all you have to do is enter this years event and attend the prize presentation to be in the draw for the Fantastic new Quintrex 385 Explorer boat, with 20hp Yamaha motor and trailer prize valued at over $7500.00 ! This years competition is made possible with the continued support from Yamaha Motor Aust. who have donated the fabulous 20 hp motor in conjunction with Ken's Marine Canberra, who have supplied the new Quintrex 385 Explorer boat and trailer. We thank Yamaha , Quintrex and Ken's Marine for their generosity and hope that you will be able to support them in future. This years prize presentation will be held at the Berridale Community Hall from 2pm on Friday the 4th of November 2011. There will be hot food, soft drinks and beer available for sale with catering being supplied by the Adaminaby CWA and the Berridale Hotel. You also have the chance of winning $1000 worth of quality tackle for each fishing category. Our ability to make these prizes available is due to the strong support from some of Australia's leading tackle wholesalers, EJ Todd & Son, JM Gillies, Pure Fishing, Clarkson Imports, Dunphy Sports, & Saga Tackle. Combined with the strong support from local business's helps make this a fishing event not to be missed. There will be daily "secret weight cash prizes" for brown trout and rainbow trout valued as much as $1000.00 each. We're also maintaining the prize pool on the Clubs/Team Category at $1000.00 CASH ! There will also be the prized Festival Beer Glasses for the largest rainbow and largest brown trout recorded at each weigh-in centre. The committee hopes that you will enjoy the fishing and sites which the beautiful Snowy Mountains area has to offer,and look forward to seeing you all again.